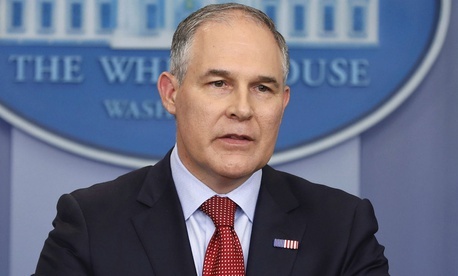 The Environmental Protection Agency will no longer prevent agency scientists from presenting their research, Administrator Scott Pruitt told lawmakers this week, though he said he will move forward with his plan to give more weight to anti-climate change research. Pruitt told the House Energy and Science Committee’s panel on the environment he will launch his controversial “red team, blue team” initiative as soon as January. The controversial proposal will reignite a debate previously considered conclusive at EPA, namely the role humans and the emissions they generate play in climate change. "That's an ongoing review internally, and it's something we hope to do," Pruitt said on Thursday. "That would be a process where we would focus on objective, transparent real-time review of questions and answers around the issue of CO2." Pruitt has said he envisions compiling a team of climate change skeptics to publicly debate a team of climate scientists who would defend existing research. Republicans at the hearing praised the plan and called on EPA to undo the underlying decisions that have enabled the agency to issue regulations that curb the release of harmful emissions. “Scott Pruitt’s call for a ‘Red Team, Blue Team’ debate on climate change is a farce and a distraction,” said Peter Frumhoff, the group’s director of science and policy. “If he has questions about climate science, he should turn to the U.S. National Academy of Sciences, not hacks from the Heartland Institute.” The Heartland Institute is a right-leaning think tank that rejects the scientific consensus on climate change. Ken Cook, president of the Environmental Working Group, said Pruitt will have to turn to elementary school students to staff his team of climate change deniers. The Union of Concerned Scientists has also sounded the alarm over EPA’s cancellation of a presentation by some of its employees on the effects of climate change on the Narragansett Bay in Rhode Island, which the group said amounted to silencing the agency’s researchers. In response to a letter from several Democratic senators, Pruitt said this week that would not happen again. The administrator added he was committed to ensuring the agency’s scientific data is “presented openly and with integrity, and is free from political interference.” That did not give EPA scientists free reign to present whatever they wanted, however. A dozen New England lawmakers who wrote to Pruitt praised the decision, while also criticizing his larger record on climate policy. Pruitt has come under fire for replacing academic scientists on an agency review board with industry representatives. Employees at scientific agencies across the federal government, including the EPA, have launched protests and voiced their concerns about a perceived disregard for scientific data by the Trump administration.